As we mark day six of a partial government shutdown, the impact isn't limited to Washington. 41 Action News has learned some local court cases will experience delays because of the funding impasse in D.C.
KANSAS CITY, Mo. — As we mark day six of a partial government shutdown, the impact isn't limited to Washington. 41 Action News learned some local court cases will experience delays because of the funding impasse in D.C. It's because of the Department of Justice's contingency plan, which kicks in during a lapse in appropriations. According to the plan , "civil litigation will be curtailed or postponed to the extent that this can be done without compromising to a significant degree the safety of human life or the protection of property." By Dec. 26, motions for time extensions were filed in civil cases on both sides of the state line. One of the cases surrounds the death of 13-year-old Kente Summers, who was killed in a car accident at 18th Street and Benton Boulevard in October 2014. A USPS worker was accused of running a stop sign and causing the crash. In a court document filed this week, U.S. Attorney for the Western District of Missouri Timothy Garrison requested a 30-day extension to respond to a motion to compel discovery. "Absent an appropriation, DOJ attorneys are prohibited from working, even on a voluntary basis, 'except for emergencies involving the safety of human life or the protection of property,'" the filing reads. Across the state line, a case involving the Leavenworth VA is also experiencing a minor delay. In January 2017 court documents show 84-year-old veteran John Cedar fell and hit his head on the stairs at his home. He was taken to the Dwight D. Eisenhower VA Medical Center, where his family says doctors told them John needed surgery at KU. They claim hours passed, yet he was never transported. "That night he slipped into a coma because his brain was full of blood," his daughter Kerry explained. The family filed a wrongful death suit, which is now subject to a 14-day delay. U.S. Attorney for Kansas Stephen McAllister requested the extension to file a brief in support of summary judgment in the case. "While many DOJ employees with law enforcement or national security responsibilities are exempt from the required furlough, civil AUSAs such as counsel for the United States in this lawsuit are not exempt and are prevented from working while the furlough is in place," the court document reads. The shutdown is frustrating for those waiting for their day in court. "It doesn't help any of our situations. It just is a backlog," Kerry said. 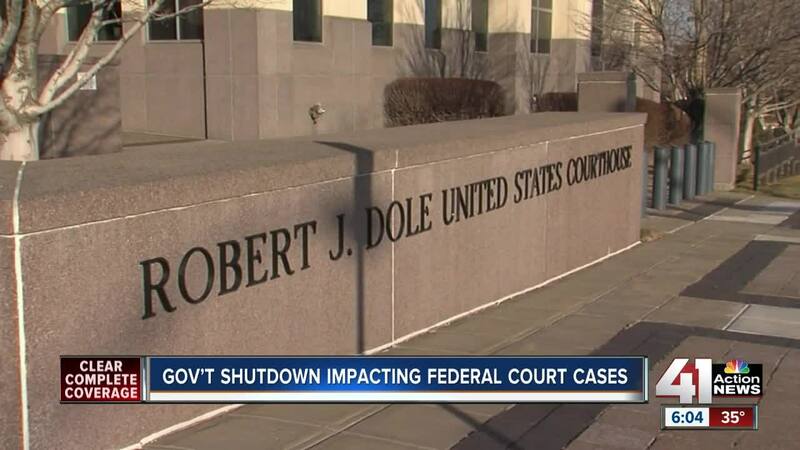 The judicial branch has funding to operate through a three-week partial shutdown, which would go through Jan. 11.